The sun came out for the last day of the Albany Farmers’ Market 2014 season. 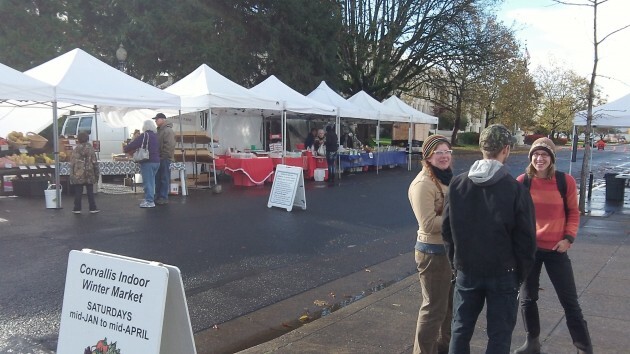 I’ve admired the producers from around the valley for sticking with the Albany Saturday market well past the summer. Most recently, the weather on Saturday mornings has not exactly been an invitation to stand outdoors for a few hours — albeit under canopies in most cases — and hope for customers to show up. Our City’s Farmer’s Market is a great touch for the downtown area. Sure not much input or assistance from CARA. This shows how grass roots efforts of individuals pay off. Local grown, local health, local goodness. On a note of downtown past. Perhaps Mr Hering might recall the Spring Arts Festival put on in our downtown years ago. Now that was a happening! 1st Ave was blocked off as were side streets. That made for (4) blocks of local creative expression! Artist of some note got involved. Our arts classes in our schools got involved .Later, large tents were erected on Water Ave to facilitate the exhibits. Opening day is April 18, 2015. We set the calendar by working back from Thanksgiving and sticking to our rather ambitious 32-week season. It’s pretty much always the 3rd Saturday. Thank you for running this! It did not show up in my Google alerts. I’ll share it on Facebook.